A volunteer position with Heritage for Peace is open to assist with preparing this newsletter on reporting Syrian heritage during the conflict. In addition to training, the post requires c. 5 hours remote work per month, and a high standard of English. Please contact us to apply, noting the guidelines to volunteers on our Contact Us page. Isber Sabrine, Chair of Heritage for Peace, met Dr Federico Mayor Zaragoza – the president of the Foundation Culture of Peace and the former director general of UNESCO in Madrid in February. They discussed the future collaboration between the two organizations and the importance of working through culture to build peace in the world. Fredrico Mayor Zaragoza played an important role in creatibng the program at UNESCO Culture for Peace. Heritage for Peace is honored to meet him and to learn from his work on peacebuilding. Because of the cracks and destruction in the body of the minaret it currently requires urgent emergency operations to address the danger. You can see the photo on the Facebook page of Syrian Heritage Archives. An Italian photojournalist, Giorgio Bianchi, documented the state of the famous Syrian archaeological site of Palmyra almost four years after its destruction by ISIS militants. A slow return to normality, a rebirth from the rubble that also passes through the contribution of Italian restorers. See the photogallery by National Geographic. A Facebook user named Salah Maraashi has posted new photos and a panorama of Aleppo. Authorities discovered Syrian artifacts prepared for smuggling in Zamalka town and the city of Douma in the Damascus Countryside. Read more on this at the Syria Times. The Syrian National Committee for the UNESCO, Syria Trust for Development, and the Ministry of Culture, recently organized an event to celebrate the inclusion of shadow play as the first Syrian element in the List of Intangible Cultural Heritage in Need of Urgent Safeguarding. Learn more about this at SANA. Haneen, a choir of Syrian women in Berlin continuing Syrian song heritage, recently played its first major concert to celebrate International Women’s Day. To learn more you can go to the TRT World website. This concert will be a meeting between European classical music and traditional Syrian music, featuring Latvian soloist Ilze Kirsanova. Rue Ravensteinstraat 23, 1000 Brussels, Belgium. The Syrian Heritage Festival marking the Syrian New Year 6769 recently began in Aleppo. The Damascus Cultural Festival began at Dar al-Assad for Culture and Arts with cultural, artistic and literary activities, as well as a display of archaeological materials, and a talk on the general situation of the Syrian museums, including the damage suffered and the theft of some of their contents. Learn more on SANA and on the DGAM website. Tell a Story Syria was a workshop in Berlin that took place 15 March on Memory, storytelling and Syrian heritage, organized by the project ‘The Interactive Heritage Map of Syria. Their Facebook page has more information on this. AFP News Agency published a short video about the revival of traditional laurel soap making in Aleppo. You can watch the video on YouTube. The DGAM are preparing for the reopening of the Arab Medical and Science Museum in Damascus on Sunday, April 14, at 1 pm, as part of an official ceremony organized by the Ministry of Culture as part of its plan to reopen the various national museums. According to the DGAM’s website, the National Museum in Damascus has received a model of the niche of the Temple of Baal which was destroyed by the terrorist group IS. Italian artists created this piece under the supervision of the Association Cultura Priorita, headed by the former Mayor of Rome, Francescini Rutli, and the Italian mission in Ebla. This version has been manufactured with three-dimensional printing technology and with great accuracy, adding the influences of traditional colors and materials to give it the ancient archaeological character of the temple’s ceiling, which is decorated with beautiful and rare engravings. According to the DGAM’s website, the DGAM team has finalized the field survey of the Damage Assessment within the first phase of the project “Recovery of the Ancient city of Bosra” under the patronage of UNESCO. The first phase included monitoring of the structural situation and damage assessment of the archaeological fabric. The information was downloaded on forms, field surveys of illegal excavations were carried out, as well as three-dimensional documentation of The Kalybe, “Cradle of the King’s Daughter” in order to import the data to the GIS system. The Irish Times reported on the restoration of the Khalid Ibn al-Walid mosque, recently inaugurated by Syrian and Chechen Clerics. The Saqatiya souk, located near other landmarks of Aleppo’s UNESCO-listed Old City, is undergoing renovations that are expected to be completed in July. Saqatiya market is one of around 37 souks surrounding the Aleppo citadel, the oldest covered markets in the world, according to France24. On 2 April the Authority of Tourism and Protection Antiquities in the territory of Jazair completed the second phase of the restoration of the Tell Beydar Mission House which took 15 days. The Authority of Tourism and Protection of Antiquities make scientific trips for university students to many archaeological and tourist sites in Al-Jazirra territory and it will continue until June according to their website. ATPA also has new photos of excavations at the site of Sheikh Hamad al-Athari, located between the governorates of Deir al-Zour and al-Hasakah, it was previously excavated by a German mission of the Free University of Berlin. To learn more about this go to the ATPA website. Tourists from France, Canada and Switzerland recently visited Palmyra, one of the first foreign tourist groups to visit in recent years. Future tours are planned for the remainder of 2018 and in 2019. You can learn more about this at the Syria Times. A delegation from the French school of Charles de Gaulle in Damascus also recently visited Palmyra. To learn more go to the SANA website. A Spanish television team is creating a new documentary on the site of Palmyra. If you want to learn more go to the SANA website. Russian Defence Minister and President of the Russian Geographical Society (RGO), Sergey Shoigu announced that Russia would hand over files related to the restoration of Palmyra to UNESCO, including a three-dimensional model. Read more on the Middle East Monitor website. A Kickstarter project seeks to raise funds to provide scholarships to students and professionals from ICOM Red List countries, nations where cultural heritage is at particularly high risk of being stolen, looted and destroyed. Those who receive them will be trained as part of the ARCA Postgraduate Programme in Art Crime and Cultural Heritage Protection. Read more and find the links on Trebuchet. The project aims to create accurate 3D recordings of heritage sites at risk using new technology and to contribute to capacity building in the region, the transfer of knowledge and the creation of permanent architectural inventory units. The project began in Syria, in partnership with the Directorate General of Antiquities and Museums (DGAM), and has documented six sites located in Damascus that illustrate the architectural variety of historic buildings in the ancient city. Learn more on the ICOMOS website. Heritage in the Crossfire has launched their new website, which examines the difference between modern warfare damage to natural weathering processes. 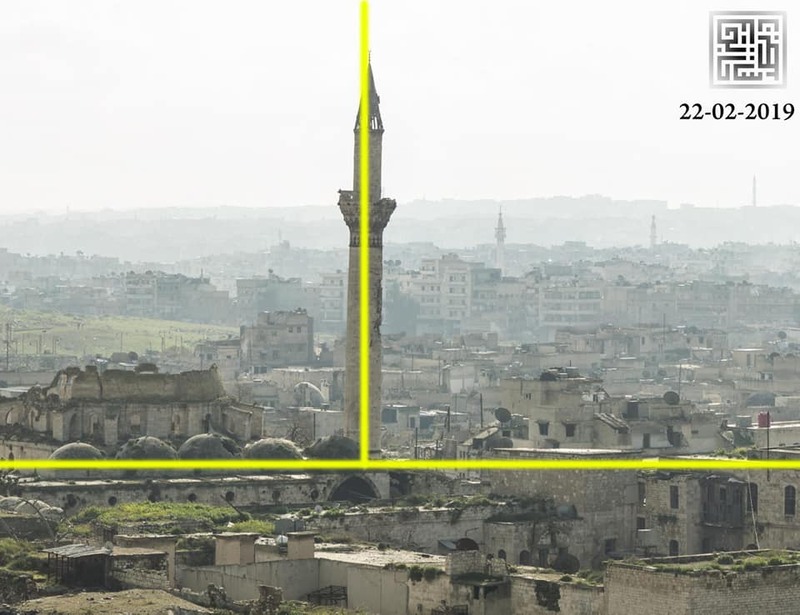 Through satellite-detected damage analysis, REACH established an atlas of Syrian cities, documenting the impact of the civil war on the country’s urban centers. Read the recently published report on the REACH website and view ICONEM’s 3D models of Aleppo’s city center on Sketchfab. To mark the 10th anniversary of the mandate on cultural rights and the 70th anniversary of the Universal Declaration of Human Rights, the Special Rapporteur in the field of cultural rights has written a report (available on the UN website) to give an overview of the work of her mandate including suggestions for strategies for advancing cultural rights during the next decade. Abdulrahman Bakr’s thesis on Redesigning Saadalah Al-Jabri Square in Aleppo has an interesting vision for the future of public sphere in Aleppo. To learn more about this or to read the thesis go to the website for The Aleppo Project. The Department of Anthropology at the J. William Fulbright College of Arts and Sciences at the University of Arkansas, presented a lecture, “Analyzing Conflict Damage to Cultural Heritage from Above: Results from the ASOR Cultural Heritage Initiatives in Syria, Iraq, and Libya,” by Susan Penacho as part of the Robert L. Stigler Lecture in Anthropology and Archaeology series. Learn more on the University of Arkansas website. Cité de l’architecture & du patrimoine hosted a panel discussing future perspectives for the Crac des Chevaliers site, following its exhibition Le Crac des chevaliers: Chroniques d’un rêve de pierre. Layla Abdul Karim, architect at Iconem, shed some light the work there, a comprehensive interior and exterior scan of the structure completed in April 2017 as UNESCO’s scientific service provider. You can watch the video on the Cité de l’architecture’s Youtube page. A photo exhibition on damaged Syrian archaeological sites and monuments opened at the Regional Museum in Jílové area near Prague in cooperation with Prague’s National Museum. Read more on the Syria Times. ArchNet interviewed Ms. Lamis Kadah about her project “Pieces of Syrian Heritage,” part of a larger project “Stewards of Cultural Heritage – SoCH” launched in October of 2016. CBS News reported on the state of Palmyra and nearby Syrian residents. Of the 80,000 people who lived near Palmyra before the conflict, only 35 families have returned. The Syria Times wrote about the role of women in the historical development of Syrian art and modern female Syrian artists. Newsweek published photos showing damage to Syrian historic sites, including Palmyra and the Umayyad mosque. Al Monitor wrote about the changes in traditional street food in northern Syria.